It was always a dream of Eric Skrzypek to play hockey with his son. Growing up and constantly being involved in sports, it just became an accepted fact that if he was fortunate to have a son, they would bond together through that avenue. Eric was indeed fortunate and had a son, Luke. He hoped that one day, his boy would embrace the same love for hockey and they would be able to spend countless hours together on the ice. But the dream as Eric had envisioned never came to fruition. Luke was diagnosed with autism and epilepsy, torpedoing his chance at a future involving sports. And sometimes, though maybe not the way they originally had wanted, those original dreams could still become reality. 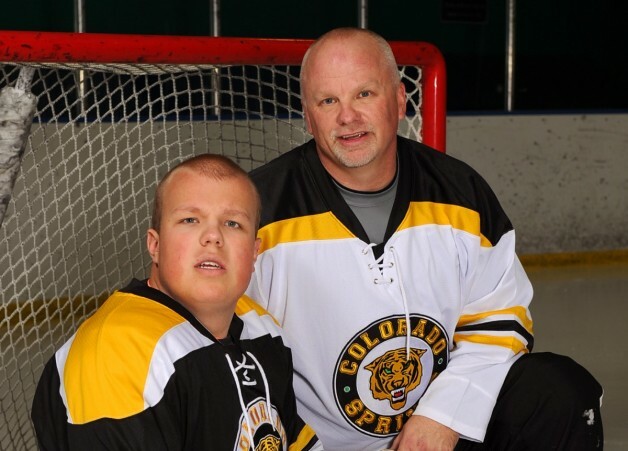 Through another disabled child, the Skrzypeks heard about sled hockey, part of the adaptive hockey program run by the Colorado Amateur Hockey Association (CAHA). They called the CAHA liaison for adaptive hockey, Doris Donley, and asked about checking it out. It did take some easing into it for Luke to really get comfortable with the atmosphere. With autism comes a lot of sensory issues and getting Luke into a new environment with new people and a new experience set some of them off. But Eric knew that once he got comfortable, it was a situation that his son would really enjoy. All it took was the comfort of his father being there to help get Luke acclimated to sled hockey. For the first time in his life, Luke was involved in a team atmosphere, something Eric said he can see Luke desperately wanted to be involved in. Every Saturday, Luke now gets to hit the ice and compete with other kids, and do it with his dad at his side. In a situation where Eric felt he had to adjust his dreams and ambitions for his son, he’s getting to watch one of the most important dreams unfold. For all the branches of CAHA that has worked to make as many people involved in the sport of hockey as possible, the adaptive program stands out as one of the most impactful. A quick glimpse at a family that is able to live out a dream that was long thought dead is the best example of what the organization is capable of. For Eric and Luke Skrzypek, sled hockey has been a saving grace of what was once a very difficult aspect of their life.